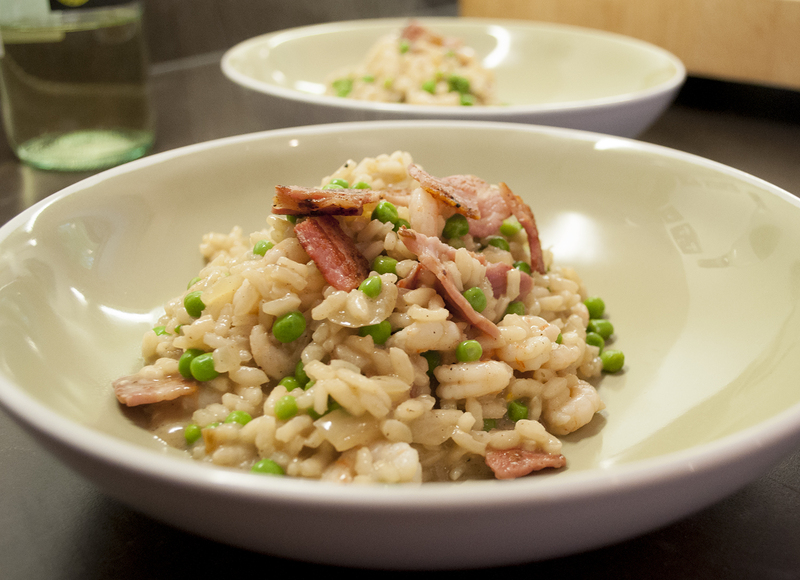 It’s a while since we had a risotto and knowing I had some prawns, peas and bacon in the freezer, this was the obvious. Heat the oil in a pan and add the shallot. Cook until softened. Add the risotto rice and stir well, ensuring it is all coated in the oil. Add a splash of wine and cook to reduce. Add a ladle of stock and allow to cook until all absorbs. Repeat until the risotto is almost cooked. Cook the bacon to your liking in a separate pan. Add the prawns and peas to the pan with the last ladle of stock and allow to cook. Finish by adding a little butter to the risotto and stir to melt. Serve the bacon on top of the risotto. Risotto is so worth the long cooking process! We love it in our house! It is. Always takes longer than any stated recipe in my opinion. Oh dear. I cooked on one at a family members a few weeks ago so I really sympathise! !